Hopefully you noticed the big temperature control at the top of the page. You can use it to see how elements behave at different temperatures. You can see either magnetic properties or states of matter by changing the title (in the top left) between "Magnetism" and "States". There are also other settings you can access by clicking on the settings icon ( ). Thanks to Periodic Videos, you can click on any of the elements to see an awesomely informative video about that element! 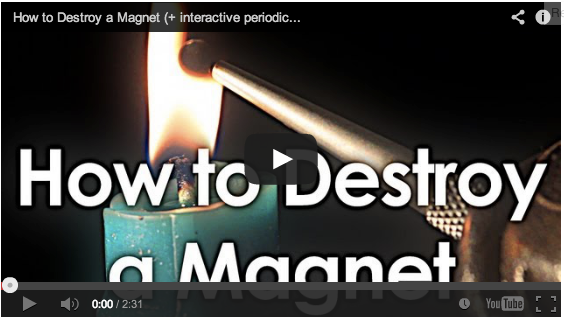 As Henry explained in his video, matter can take on one of five magnetic states: Ferromagnetic, Antiferromagnetic, Paramagnetic, Diamagnetic, or Ferrimagnetic (we're going to ignore that last one for now). Some elements can change between ferromagnetic, antiferromagnetic, and paramagnetic by heating or cooling them. This is a lot like elements transition between solid, liquid, and gas. This "melting" of magnetic states generally happens in this order: ferromagnetic, antiferromagnetic, paramagnetic. The ferromagnetic "melting" temperature is called the Curie Temperature (Tc), and the antiferromagnetic "melting" temperature is called the Néel temperature (Tn). Sometimes elements may change right from ferromagnetic to paramagnetic, others transition between all three, and others never become ferromagnetic or antiferromagnetic at all! But why does this happen, you ask? Well it boils down to how the atoms jiggle around in the material. ferromagnetic, antiferromagnetic, and paramagnetic materials are made up of a bunch of magnetic atoms (the ones with half-filled electron shells found in the middle of any of the major blocks of the periodic table). If the temperature is too high, there will be too much jiggling for the atoms to align (or anti-align). This causes the bulk material to melt out of its ferromagnetic (or antiferromagnetic) state. Take Dysprosium and Gadolinium, for example. Dysprosium has both a Curie Temperature, and a Néel Temperature (ferro > antiferro > para). Gadolinium only has a Curie Temperature (ferro > para). Move the temperature control below and see if you can figure out where these critical temperatures are. MinuteLabs.io Periodic Table Artwork by Henry Reich is licensed under a Creative Commons Attribution-NonCommercial-ShareAlike 3.0 Unported License. Permissions beyond the scope of this license may be available at https://github.com/MinutePhysics/PeriodicTable. PS: By the way, the code for this website is freely available on github under the GPLv3 License.